GE is one of the leading companies when it comes to household appliances. One of the best things about this company is its innovativeness. For years, it has been developing appliances using technology and “ecoimagination” as its major tools. According to GE, this is for the consumers' comfort, convenience, and electrical protection and control. As part of these goals, GE introduces its WDSR2120. Although this washer has many features that boast of technological advancements, there are still a lot of aspects that need to be improved in this washer. Read on to know how people rate GE's WDSR2120. 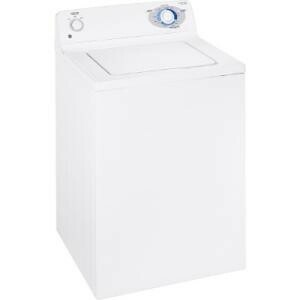 GE's WDSR2120 has a rotary electronic control system which makes it easy for the users to wash different types of loads. Whether one is going to wash jeans, blankets, or delicate apparel, this special control system will match the washing action with the type of load. This system includes 12 cycles that ensure that the clothes would be thoroughly cleaned. The 12 wash cycles include settings and options for whites, colors, easy-care, delicate fabric, and light to heavy soil cotton items. This washer has the feature that many consumers want in a laundry equipment—the large loading capacity. It has a wash basket which measures 3.2 cu. ft. With this feature, one can wash many items with juts a single load. As a result, the time spent for washing would also be reduced. Through this time-saving feature, the user will be able to do more household chores within a day. Aside from these, the users can also save a great deal of water and electricity in the long run. The Flex Care Agitator is one of the innovative and highly useful features of this washer. This feature ensures that the laundry items are thoroughly cleaned without sacrificing the quality of the fabric. This special agitator actually makes sure that the fabric items are not damaged in the process of doing the laundry. The Perma Tuf II wash basket is stain free. This stain-free feature is permanent. Because of this unique make, one doesn't have to worry about the interior of the washer. The WDSR2120 interior would stay white for a very long time. Another useful feature of GE's WDSR2120 is its temperature control settings. There are three wash and rise temperatures for this washer. And this feature allows the users to have options for the way the laundry items need to be washed. The temperature control is also important in reducing the risk of wear on the fabric. For energy efficiency, this washer has three levels. This levels will enable the users to save water. This is possible because the different levels will help the users control the right amount of water based on the load. The Quiet-by-Design is an insulation system that makes sure the washing action will not emit any undesirable sounds. It makes this washer ideal for people who want a quite and peaceful home. For many consumers, one of the best features of this washer is its excellent wash system. This includes the 12 cycles that facilitate the thorough washing of the different types of clothes. Another excellent thing about the wash system, according to users, is its fabric care features. Many users do not have to worry about damage to their clothes, for this washer ensures a damage-free washing. The silent washing action of this laundry equipment is also a plus factor for some consumers. The stain free wash basket is also an excellent feature for others. There are consumers who think that the best feature of this washer is its noise-free spinning. For them, this is what makes this washer an excellent washing equipment to be installed at home. The heavy loading capacity of this laundry machine is also very advantageous. Through this, one can save time and energy. For some consumers, this washer does not have many disadvantages. Among the limitations that some consumers cite are the limited options and designs for this washer. Actually, this laundry equipment is only available in white. Because of this, shoppers who are particular on the style and color of their household equipment are not really enthusiastic about this top load model. GE's WDSR2120 is far from perfect. But compared to its counterparts, this washer offers features that can make one's washing an easy task. For shoppers who can sacrifice design and elegance for efficiency, this washer is a good buy. Machine just over 1 year old - cycle selection knob, busted (can turn the dial underneath using your thumbs) and although water appears to drain after the wash is finished, there is some trapped between the basket/drum and somewhere else, because if you push down on the basket you can hear water squishing around and it comes back through the holes and the machine is starting to stink of mildew (lid is always kept open after use). NOT IMPRESSED with this machine. Had an Inglis (almost 30 year old machine) that only required a couple of repairs that cost only a few bucks. I will NEVER buy a GE washer again. I do not like this machine, flooded my house after owning it about 1 year! Not happy! And Ask Them Why Is It Taking So Long For Repair. They Said They Trying To Find The Part.This Is Bad Going On Three Weeks. I recently bought my first house and along with it, I bought my first washing machine. While shopping at Best Buy, I was amazed at all the styles, sizes, functions and brands of washing machines I had to pick from. I wanted a model that was affordable but still had all the wash cycle choices I needed for my families needs. I chose a GE 3.2 Cu. Ft. Super Capacity Washer. I selected the GE brand because it is a brand name that I know and trust. All of the new appliances I bought for my home are GE as well. So this was the logical choice for my washer. I wanted a choice of cycles, water temperatures, load size and speeds. This washing machine has all of these options for an affordable price. It has 16 wash cycles, four wash/spin speed combinations specialized by fabric type, four wash/rinse temperatures and four water level choices. All of these features let me select to proper care for my individual wash loads. It is a basic washer that, I anticipate will last for years. It can withstand the washing needs of my family. The wash tub is even large enough to hold my king size bedspreads! This washer is a good choice for any family. I wouldn't recommend this product. It was put in my condo in 2006. Two years later it overflooded our entire place due to "faulty calibration tubing". I even saw another review stating this exact thing happened to someone else last year. Bought this per consumer product reviews that were good...the water DOES sit in the bottom and stink. Also, this is the SEVENTH time since October 2008 that it has broken. Tub breaks and burns up motor...won't spin. Will never buy GE again. This washing machine is a good choice. The super capacity makes it easy to wash larger loads that most washing machines can not handle. There are many different cycles to choose from. The clothes get clean enough in one washing, even when washing things that normally would need to be washed twice. This washing machine outperforms many of the washing machines I have ever used.